Like a koeksister, Warm Water Bollas is the smaller version of the traditional South African treat, made from fried dough and soaked in syrup, then covered with coconut. 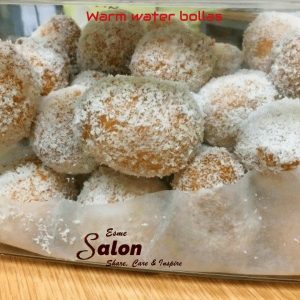 This recipe makes roughly 36 bollas. Desiccated coconut to roll the balls in. Cream the castor and eggs till creamy and frothy. Add in the vanilla essence and oil and beat till well combined. Sift in the cake flour, elatchi powder. and baking powder, fold till just combined. Add in the buttermilk and again fold in till just combined, there will still be a lot of lumps. Cover your bowl with cling wrap and set aside for 30 minutes. Using your mechanical ice cream scoop, scoop out the mixture and drop into hot oil. Deep fry till lightly golden brown, remove from oil with a slotted spoon and drain on a paper towel. Bring 2 cups water and 2 cups white sugar to a boil. Allow it to boil for 15 minutes. With the syrup on a low heat but still simmering, drop the bollas in a couple at a time. Quickly roll the ball in the syrup. Remove and immediately roll in desiccated coconut.